Students draws a card and chooses a place to put their designated letter (an X or an O). 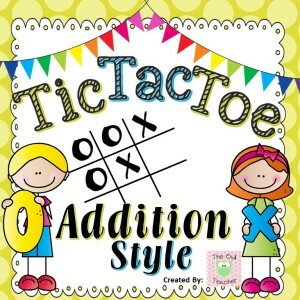 Just like tic-tac-toe, students want to get three in a row to win, while blocking and preventing their partner from doing just that. So in order to place their letter, they must solve the math problem correctly. Each time a student wins a round, he or she will keep that task card and move on to another. The student with the most task cards at the end, wins! Below is an image of four different task cards! 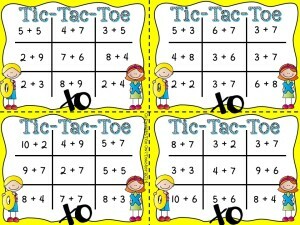 You can download this entire set of task cards FREE by heading over to my Teachers Pay Teachers store here. near my store name and CLICK it to become a FOLLOWER.